The 5-0 final score didn’t quite tell the whole story in an intriguing League 1 Ontario Cup home field victory for Durham FC United over Kingston Cataraqui Clippers on Thursday night. For one thing, two of those five goals were scored at the nintieth minute or beyond by Shaquelle Agard, who took advantage of a pressing Clippers side to chip or slip the ball into an open goal. For another, Eugene Alves in the Durham net stood very tall and wide to stop any chance Kingston created. The League 1 Ontario Player of the Week a week ago, Alves was sharp on a number of Kingston efforts and prevented any shots from finding the goal. 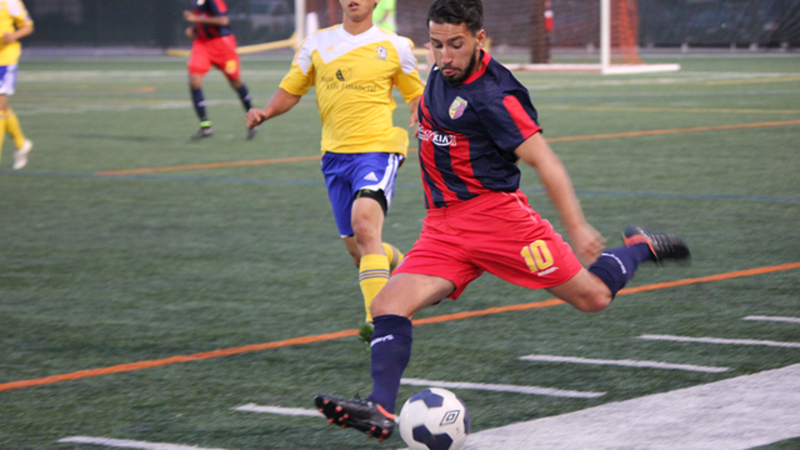 Alves said he was pleased with the result that came before a large crowd of Oshawa Kicks' youngsters out to support the local League 1 club. “It’s a good victory for us to be at home and for us to be in front of these kids here, you know it’s great because for me, it’s all about development,” said Alves. The big keeper, who had command of his area, and didn’t make a mistake the entire match, said the improved play of Durham United FC comes down to a better attitude lately. “We’re starting to have fun in practice,” he said. Durham striker David James, who had an eventful match, got the home side off to a great start by firing a thunderbolt into the goal in the ninth minute, against the run of play and after some early Kingston pressure. That seemed to wake Durham, as they began to control play and press in the Kingston half. Kyle Crichton was able to find the net in the twenty-third minute to extend the margin to 2-0 and make the mountain difficult to climb for the visitors. Talented striker Lerohne Young scored his eighth goal of the year, running on to a fine volley to beat the defender and the keeper, and at 3-0 putting the game out of reach in the thirty-ninth minute. James made it somewhat interesting for the home side by getting a pair of yellow cards inside fifteen minutes in the second half, his second coming in the eightieth minute and dropping Durham to ten men. Kingston briefly rallied but was caught on the break for Agard’s two goals. Durham coach Tony La Ferrara was happy with his club’s performance and sees a trend of better play over the past month. He figures it comes down to consistency and a lineup he can count on. “I think we have finally found our groove. The issue we had at the beginning is we didn’t know who was going to show up to play, physically, because a lot of these kids are working, still going to school. Durham leads Group A with six points after three matches on two wins and a draw, while TFC Academy has four points with a win and a draw after two matches, and Kingston just a win and a loss after two matches - good for three points and third place. Last place is held down by ANB Futbol which has one point after a draw and two losses after having played all three of its matches. The final Group A game takes place on Sept. 27 at the Kia Training Ground in Toronto, and features TFC Academy against Kingston. In League 1 action, Kingston plays in Windsor Saturday, Aug. 9, at 4:30 p.m. at Academie Ste. Cecile. On Sunday, Aug. 10, Durham heads to Kia Training Ground for a 1 p.m. match against TFC Academy.